"The @nytimes reported that about 200 people showed up to watch a wrecking ball reduce Ebbets Field — home of the Brooklyn Dodgers for 44 years — to rubble. Among those present was Roy Campanella, a short, stocky and powerful catcher who followed close behind Jackie Robinson in breaking down #baseball's color barrier. The @nytimes staff photographer Robert Walker took this photo of Campanella, sitting alone on the field that day, his No. 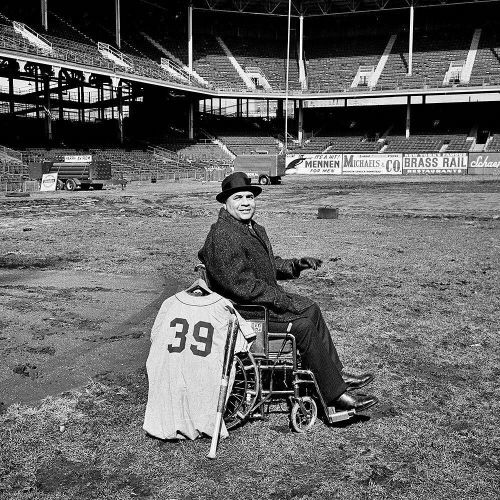 39 uniform shirt and his bat propped against his wheelchair. Like Robinson, Campanella played for only one @mlb team, the Brooklyn Dodgers. Like Robinson, he played in only one home park — Ebbets Field. And on February 23, 1960, Campanella was there to say goodbye. In every sense, this picture captured a memorable era forever gone, but @nytimes didn't publish it. During #blackhistorymonth, we're sharing unpublished @nytimes photos that reveal major moments in black history. Visit the link in our profile to read more about Roy Campanella in Ebbets Field on its final day. #UnpublishedBlackHistory" By nytimes on Instagram.